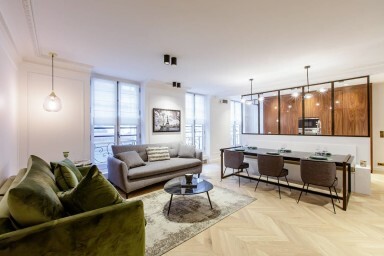 Glorious 81sqm apartment with 2 bedrooms and 2 bathrooms for up to 6 people in the best part of rue Saint Honoré, the most trendy area of Paris. This outstanding apartment is on the 1st floor with an elevator, and gives onto a quiet courtyard on the outstanding rue Saint Honoré. It opens on a spacious and beautiful living room with a modern & chic open-kitchen. You could both enjoy a family meeting or a business reunion on the large and splendid wooden table. The living room offers if needed a top quality queen size sofa bed. Bedroom 1 with ensuite bathroom and a king size bed. Bedroom 2 with ensuite bathroom and a queen size bed. 2 separate toilets are available.